November | 2012 | ohdenny. I love lemons and when I make something new, if there is a way to add lemons to it I will. 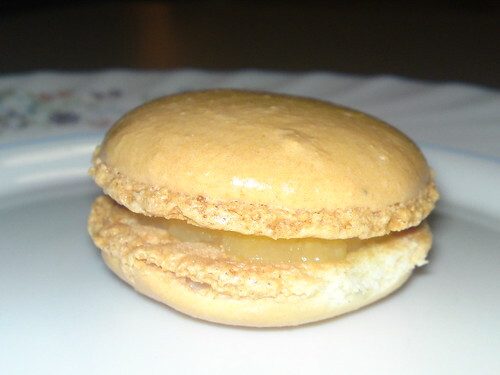 I made Lemon Macarons with Lemon Curd and they turned out quite well if I don’t say so myself. I remember making macarons again and again but never could get those damned feet until I switched to the Italian Meringue method. This was my only success with French Meringue. Check out the recipe from Tartelette Blog with the Lemon Curd recipe from Taste.com.au. 1. Preheat the oven to 300°F (325°F for a non-convection oven) 150°C, and line your baking sheets with parchment paper. 2. Blend the almond flour with the powdered sugar in your food processor to make a fine powder (or sift together, discarding any large crumbs and adding a bit more almond flour and powdered sugar as needed to compensate). Then sift the mixture through a strainer until it is as fine as you can get it. This keeps crumbs from forming on the macaron tops as they bake. 3. With the wire whip attachment on the electric mixer, beat the egg whites with the salt and the powdered egg whites (if you are using them), starting slowly and then increasing speed as the whites start to rise. Add the granulated sugar and the food coloring. Beat until the egg whites form stiff peaks and your meringue is firm and shiny. 4. Pour the beaten egg whites onto your almond flour mixture and gently fold them in, using a rubber spatula. Move your spatula from the bottom of the bowl to the edges with one hand, using your other hand to rotate the bowl. Now slap the sides of the bowl until the batter falls in a wide ribbon when you raise your spatula. When you can’t see any crumbs of almond flour and the mixture is shiny and flowing, you are ready to start piping. 5. Fit your pastry bag with a number 8 tip and fill with batter. Start by squeezing out a small amount of mix onto a parchment-lined baking sheet to form a 2½-inch circle. Be sure to leave 1 inch of space between macarons so they will not touch each other while they bake. 6. Bake for 14 minutes at 300°F/ 150°C. After the first 5 minutes, open the oven door briefly to let the steam out. 1. Whisk whole eggs, yolks and sugar in a saucepan until smooth, then place pan over a low heat. 2. Add the butter, juice and zest and whisk continuously until thickened. Strain through a sieve into a sterilised jar. Lemon curd keeps, covered, in the fridge for 2 weeks. This was the first time I made macarons and they came out with feet! I don’t know what happened with the proportions for the shell because I recall reducing the icing sugar to half but it ended up extremely sweet anyway! Maybe I didn’t reduce the sugar at all haha. I loved the lemon curd, it was perfectly sweet and sour with that lemon aftertaste tang. Lovely. Mekong is a Vietnamese restaurant located on Swanston Street, Melbourne and I’ve walked by it countless of times but never really have the urge to venture in. For one, the place looks like it hasn’t been renovated or cleaned in at least 10 years and many years back they voluntarily closed for pest control. My relatives came down for a visit and they like this kind of food so we thought there shouldn’t be any harm in dining there and it seems quite popular so it must be good? My impressions of the place were already at an all time low, and getting seated you can see that cleanliness is not their priority. Tables and floors all have food scraps around. The supposedly clean tea cups still have food remnants on them. I don’t think I’m an utter clean freak or anything, but I do like to dine at places that at least feel clean. Well I guess people come here for food so let’s talk about that. To go to a restaurant with the word Pho in it and not try their Pho seems blasphemous. 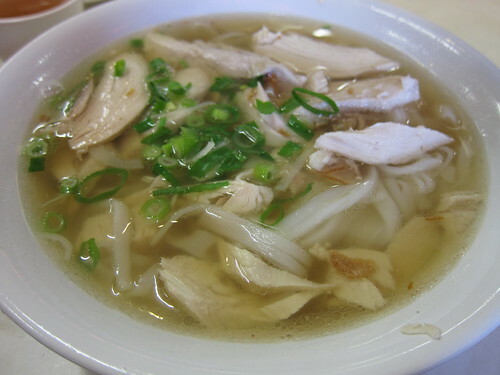 So I opted for the Small Pho with Chicken, and I think it was reasonable. The soup wasn’t fantastic by any means, that feat goes to I Love Pho on Victoria St, Richmond and Pho Hung Vuong, Springvale but respectable. It lacks that same punch you get from the others, probably MSG but flavour is lacking. Everything else is pretty much standard, it’s a nice cheapish meal but my OCD with cleanliness probably got in the way with actually enjoying the meal. Lasagne, Italian but as common as a hot dog or meat pie in Australia. I have a strong dislike for those frozen Lasagne packets, or those in the foil, they taste so artificial, lots of cheese and strange mince meat. Ever since I tried making lasagne for myself, I can never go back to the store-bought versions. The Taste.com.au recipe works a treat, isn’t too complex but still requires a few different procedures but well worth it. 1. Heat the oil in a large frying pan over medium heat. Add the onion and garlic and cook, stirring, for 5 minutes or until onion softens. Add the mince and cook, stirring with a wooden spoon to break up any lumps, for 5 minutes or until mince changes colour. 2. Add the tomato, wine and tomato paste, and bring to the boil. Reduce heat to low. Simmer, uncovered, stirring occasionally, for 30 minutes or until sauce thickens slightly. Remove from heat. Taste and season with salt and pepper. 3. Meanwhile, to make the cheese sauce, combine the milk, onion, parsley stalks, peppercorns, cloves and bay leaves in a medium saucepan and bring to a simmer over medium heat. Remove from heat and set aside for 15 minutes to infuse. 4. Strain the milk mixture through a fine sieve into a large jug. Discard solids. 5. Melt the butter in a large saucepan over medium-high heat until foaming. Add the flour and cook, stirring, for 1-2 minutes or until mixture bubbles and begins to come away from the side of the pan. Remove from heat. 6. Gradually pour in half the milk, whisking constantly with a balloon whisk, until mixture is smooth. Gradually add the remaining milk, whisking until smooth and combined. 7. Place saucepan over medium-high heat and bring to the boil, stirring constantly with a wooden spoon, for 5 minutes or until sauce thickens and coats the back of the spoon. Remove from heat. Add the parmesan and stir until cheese melts. Taste and season with nutmeg, salt and white pepper. 8. Preheat oven to 180°C. Brush a rectangular 3L (12 cup) capacity ovenproof dish with oil to lightly grease. Spread one-quarter of the bechamel sauce over the base of the prepared dish. Arrange 1 lasagne sheet over the sauce. 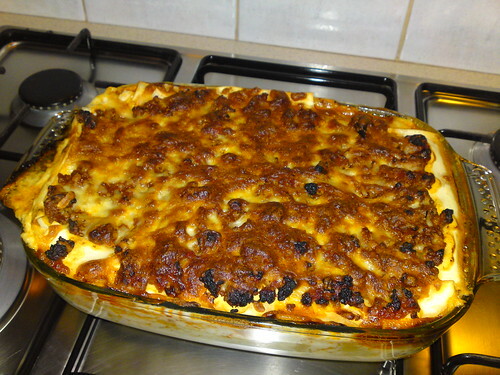 Top with one-third of the mince mixture and one-third of the remaining bechamel (Cheese sauce) sauce. Continue layering with the remaining lasagne sheets, mince mixture and bechamel, finishing with a layer of bechamel. Sprinkle with mozzarella. Place on a baking tray. Bake in preheated oven for 40 minutes or until cheese melts, is golden brown, and the edges are bubbling. Remove from oven and set aside for 10 minutes to set. 9. Cut the lasagne into 8 portions and serve with mixed salad leaves. Making lasagne is like making a tomato based pasta sauce halfway as the mince mixture is not as wet but the flavours of it and procedure is basically the same and yes I do add chilli flakes in there too. The cheese sauce needs a bit more watching as to avoid the milk mixture from frothing over the saucepan so be careful. The other focus point is when pouring the flour into the butter mixture, it can stick to the bottom of the saucepan/pot that you are using. I love the bechamel sauce that it makes, it’s so flavourful unlike those take-away sauces. I know it’s an unfair comparison but that’s what most people are used to eating. We actually used cannelloni sheets because we had some left over but they work just as well as lasagne sheets, but I think they are just a tad smaller so the sauce kinda seeps through when layering. Just layer twice and cover the gaps and it should be fine. I really do enjoy making lasagne and this recipe in particular, and the layering part is fun for kids too! Meshiya is a Japanese restaurant located on Lonsdale St, just outside the QV food courts entrance and Officeworks. They serve a selection of Bento boxes, Sushi, Rice and Noodle (Fried or Soup based) dishes along with their own selection of Japanese Rice Wine too. Meshiya is very hit-and-miss, unfortunately. The first few times I have eaten here, it was pretty good but on my last visit eating the same kind of food just wasn’t the same quality I came to expect. Apparently, there are a couple of chef/owners so whether or not you like or dislike the food would probably come down to which chef you get. I think the first couple times it was the Japanese chef but on my latest visit it was a South-East Asian chef instead where I couldn’t believe I was eating from the same place! 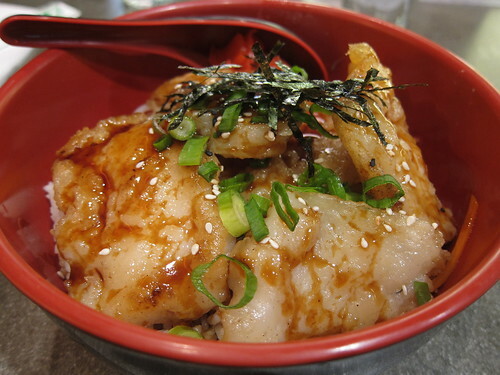 The image above was my order for White Fish Teriyaki on Rice (Sakana Teriyaki Don). I found the fish to be wonderful in taste, and still very soft and cooked perfectly. The fresh fish flavour comes through well, and the slightly milder teriyaki sauce goes well with the lightly stir vegetables underneath the fish. The amount of fish they serve you seems generous so my impressions of this dish and Meshiya were quite high. On my latest visit I had the Chicken and Fish Teriyaki and Tempura Bento and this is where all the nice impressions and expectations vanished. Firstly, the chicken was terribly overcooked. I was extremely disappointed, as they cooked the fish beautifully before and I had this sort of impression they took care in how they cooked their food. The sauce used here was different to the teriyaki sauce used in the Fish Teriyaki rice dish, it was much sweeter here, and overall more flavourful. Your usual teriyaki sauce. The fish teriyaki was very bland and also overcooked. Not delicate like before. To top it off, the rice was gluggy and also overcooked so it was all in lumps. This was probably the worst Japanese meal I have ever eaten, even some of the Chinese owned Japanese food court stores serve tastier food than this. The only reasonable part of this dish was the tempura with their wafer thin batter. One prawn, one sweet potato and one eggplant but all had minimal oil and were crisp and crunchy. 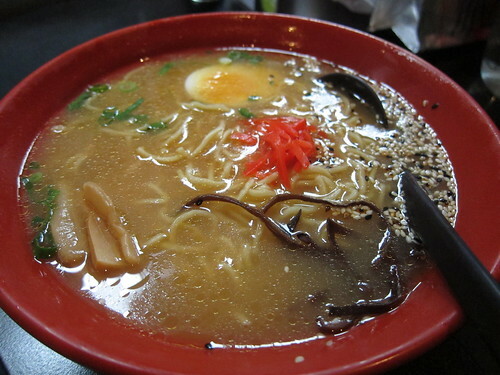 Their ramen from their Happy Hour Lunch Menu was quite pleasant. It was still a bit bland and needed some extra chilli seasoning, but for the reduced price it was a sufficient meal. Nothing special to see here. As mentioned before, I have a hard time judging this place based on my very conflicting reviews. I would like to think that my last visit was just an off day but then again, I don’t want to give people too high of an expectation of this place thinking that it might actually be okay when my last meal was pretty poor. 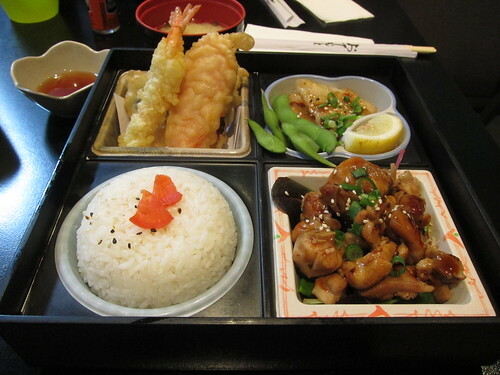 The horrible bento box has left such a bad and long lasting impression that I can’t really recommend Meshiya to anyone. I’m not even sure if I would venture there again to see if it is a one off and I’m usually quite lenient when food is just so-so and would give it another go. All I can do is caution you, and if you are served a tasty and satisfying meal, then that’s all I could ever want. I’ve already reviewed Gânache Chocolate Macarons, now it’s time to try their cakes. Well… cake (no s) for the time being. One step at a time! I bought the above pictured cake at their Collins Street, Melbourne CBD store. I heard from a few friends that their Passionfruit cake is pretty darn good but I was instantly drawn to their Hazelnut Fan Slice aka Hazelnut Mousse Cake. Being a fan of both Hazelnut for its tasty nutty flavour, and mousse as it’s so soft, light and delicate it seemed like a fantastic combination with chocolate. Their mousse cake has a couple of layers as your can see. The bottom layer is this biscuit base that has elements of nuts mixed through it, I found it to be absolutely delicious. They call it a sponge but I usually identify sponge as light and fluffy, but this seemed more like biscuit to me. 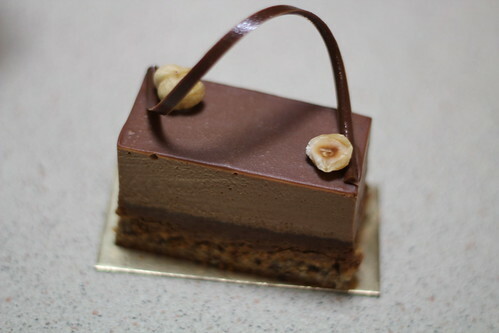 The next layer is a hazelnut praline, which is basically soft hazelnut chocolate that’s similar in texture to Nutella. Hazelnut overload yet? I think not! Apparently there is a layer of Paillete feuilletine, which I have had no experience in tasting nor could I recall eating it but it was there…I think. The next layer, more like huge chunk, is the chocolate mousse which was beautifully light and melts in your mouth instantly. It’s what I’d call a perfect mousse. The top layer is a chocolate glaze that is so soft and tasty, it really just blends well altogether. As edible decoration on top, we have a tempered chocolate curl that has that fantastic snap required. To finish the whole dessert off, there is hazelnut pieces to complete the Hazelnut cake. I’ve got to hand it to them, they really know how to create a cake for Hazelnut and Chocolate lovers. It’s almost as if this dessert was made just for me! The mousse along with that strong hazelnut flavour really creates this pleasant not too overly sweet treat. Of course it’s sweet, but it’s not sickly sweet. Now I’m really tempted to try their Mango/Passionfruit cake for a less rich option.